Pour-N-Restore Oil Stain Remover lifts and absorbs embedded oil stains as it dries from a liquid to a powder. This is made possible by combining a powerful citrus degreaser with a non-leaching absorbent. 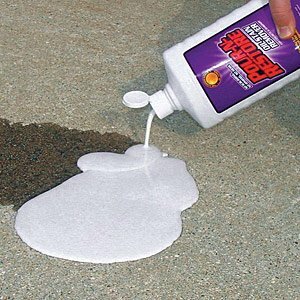 To restore concrete and masonry, just apply Pour-N-Restore Oil Stain Remover, let it dry from a liquid to a powder, and sweep it up. No scrubbing. No rinsing. No mess. Pour-N-Restore Oil Stain Remover is biodegradable, phosphate-free, and has a fresh orange fragrance. Coverage is approximately 24 sq.ft. per gallon. Not for asphalt (blacktop). We are here to serve all your garage needs. Call us for a free estimate anytime – 410-721-2342. This entry was posted on Friday, August 17th, 2012	at 2:03 pm	. You can follow any responses to this entry through the RSS 2.0 feed. Both comments and pings are currently closed.